I have always loved Italian cuisine. Sahil, my husband dreams of long getaways in the Tuscan countryside and whenever he speaks about the same I get all dreamy. 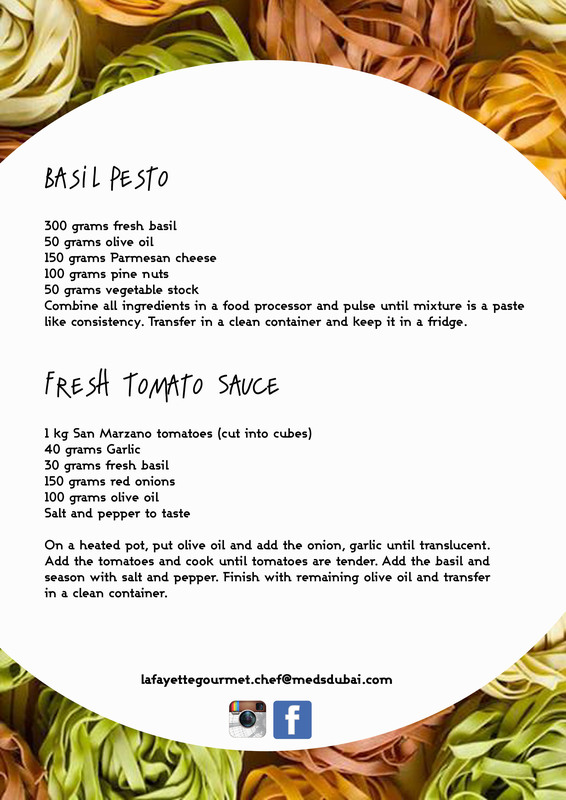 One day while casually sipping coffee and going through posts on Facebook, I came across a contest ‘Perfect Your Pasta’ by Good Magazine UAE. My eyes lit up and I quickly decided to try my luck, said a quiet prayer in my heart and participated. I am a bit of a magazine junkie, having subscriptions to most of the leading magazines crowding my work desk in the first week of every month. I usually retain cut outs of favorite articles and recipes and put them in my folder. So I was delighted when I won a spot for this cooking class. What made it perfect was that I could bring along a plus one, Sahil volunteered, it was fun cooking with him. We bonded well over pasta flour and who managed to get the consistency right. Poor guy! He struggled but he was ok after a while. 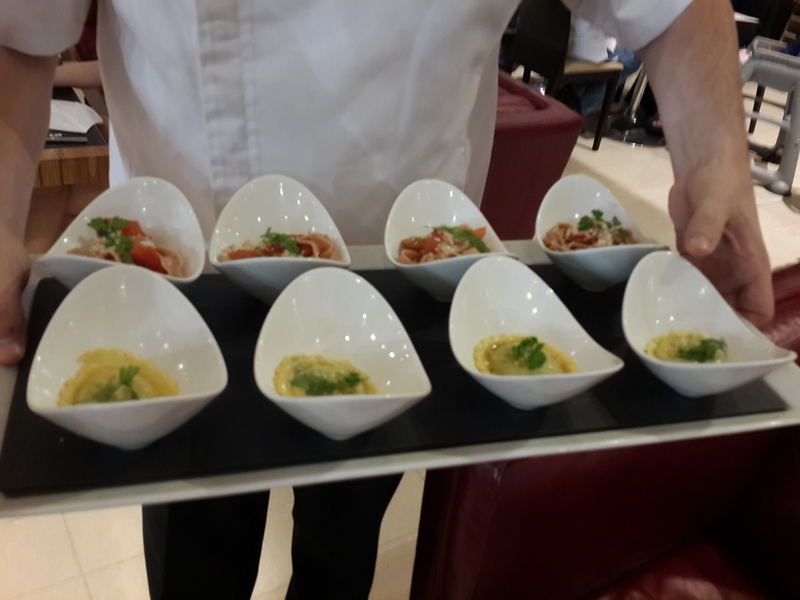 On arriving at the very plush Galeries Lafayette, we were welcomed by the PR team of the store and then were greeted by Chef Russell Imparizi, the Culinary Director for Galeries Lafayette Gourmet. 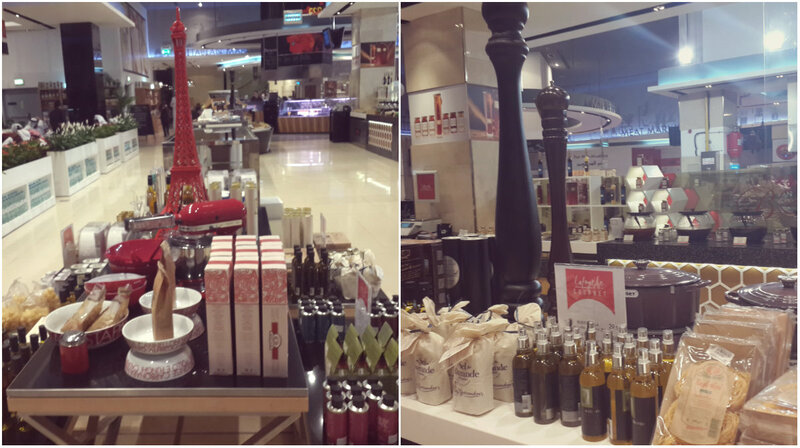 Galeries Lafayette is a French department store located in Dubai Mall. The store is aesthetically decorated. I have frequented their in-house grocery section on the second floor many times but I have never sampled the food out there. Chef Russell and his team of talented chefs took us through each and every step very patiently and were all ears to our questions. 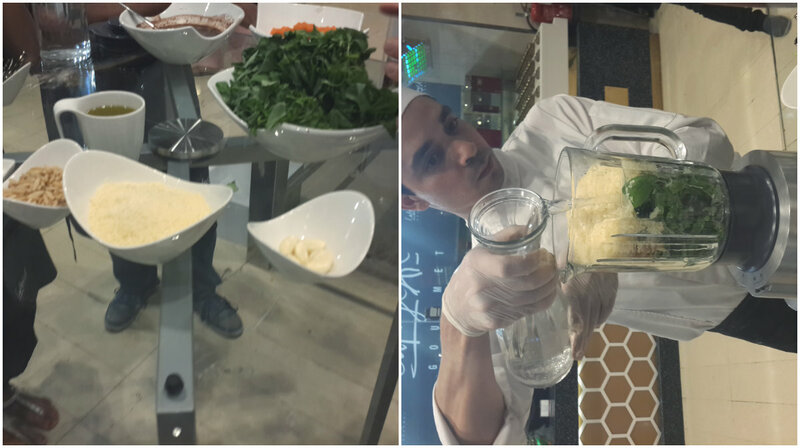 Chef Russell started by taking us through the ingredients list and introduced us to the flour used for making pasta. I was very excited since this was the first time I got to make the pasta dough on my own and actually used a pasta machine. There were two other participants apart from us. We were divided in teams of two and were allotted different work stations. 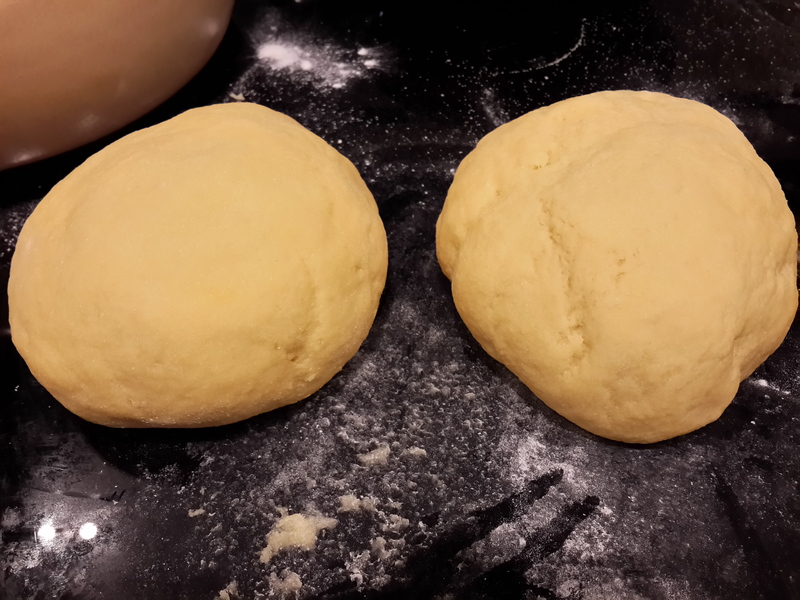 We made basic pasta dough, the one to the left belong to moi. 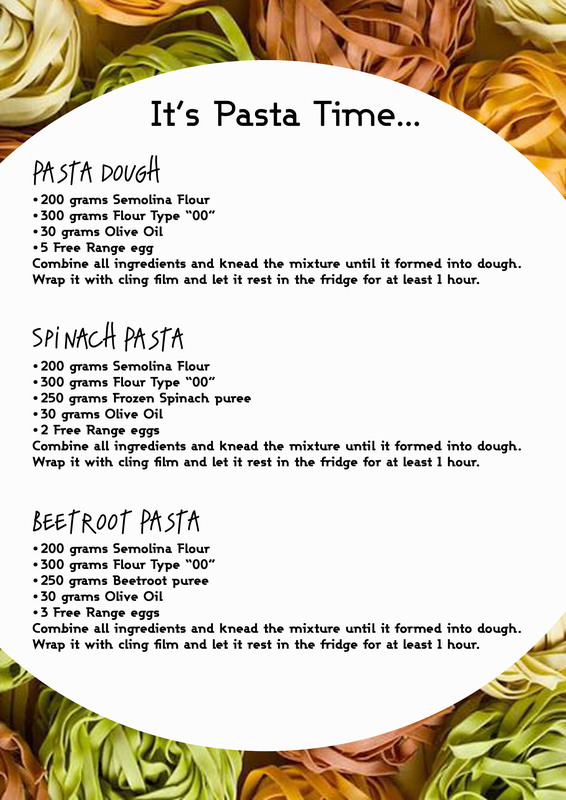 They came out pretty well and it’s amazing how easy and simple it is to make your own pasta. 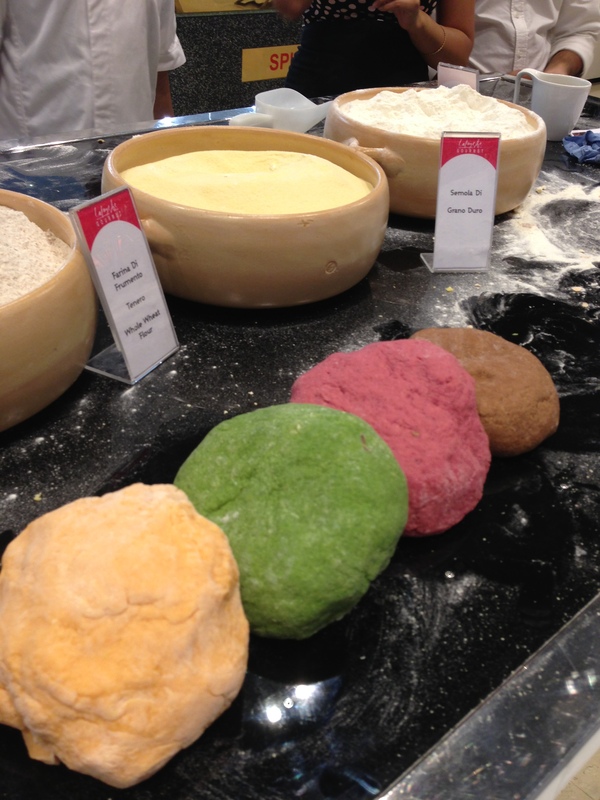 After that Chef instructed us to choose our individual preferences for making the flavored pasta dough. Sahil chose to go for Beetroot while I stuck to my favorite Spinach. Yes! I’m the Popeye of the family. Other options were chocolate and carrot. 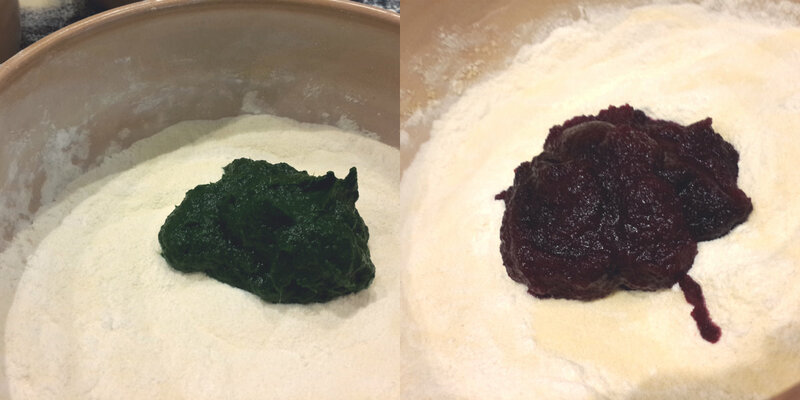 The purees were already made for us so it was easy to use a couple of spoonfuls of the puree to our basic pasta flour and then go ‘knead-knead’. You can see all the different pasta doughs stacked against each other. After the dough was made, it was allowed to rest for around half an hour. 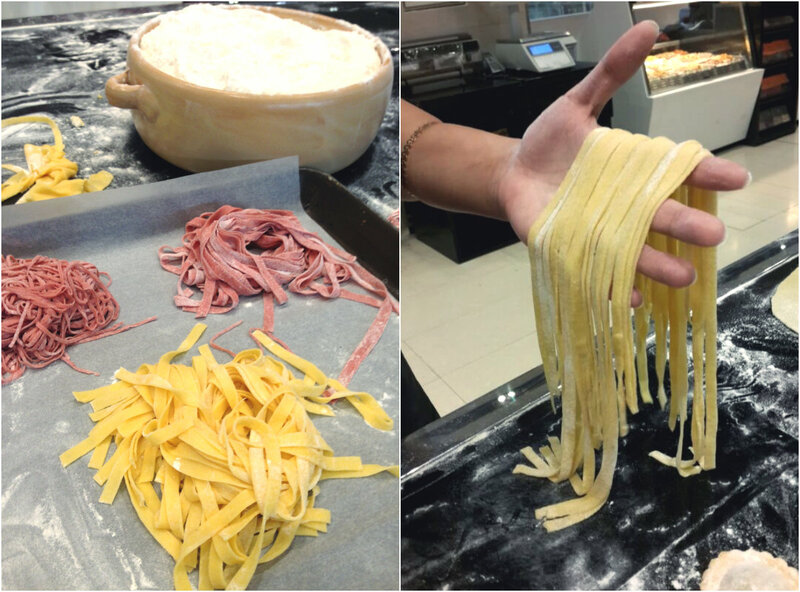 Thereafter we moved on to working on the pasta machine, it was fun making the pasta in different shapes. We made Ravioli, Tortellini and Tagliatelle pasta. 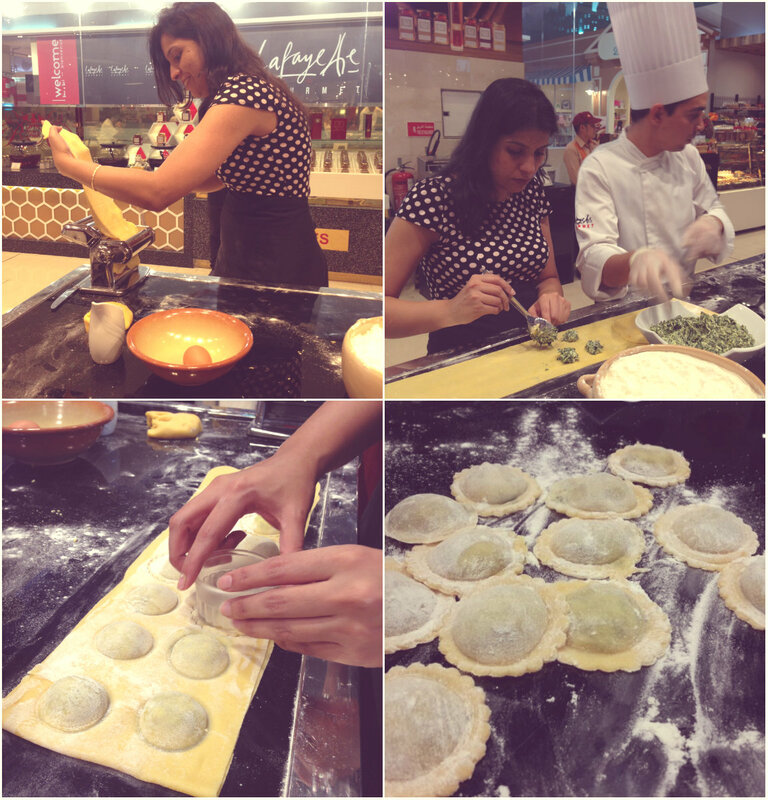 I had fun rolling the pasta sheet, layering the filling and then shaping the Spinach Ravioli. Cynthia from the PR team was great and she ensured she went all ‘click-click’. She very sweetly shared the pictures the very next day. 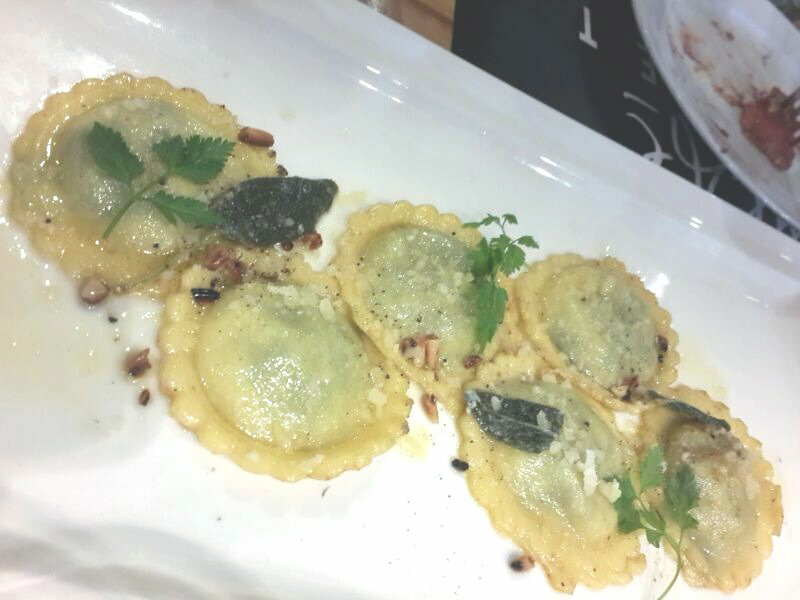 The Spinach ravioli had a spinach and ricotta cheese filling whereas the beetroot ravioli had a sun dried tomato and goat’s cheese filling. 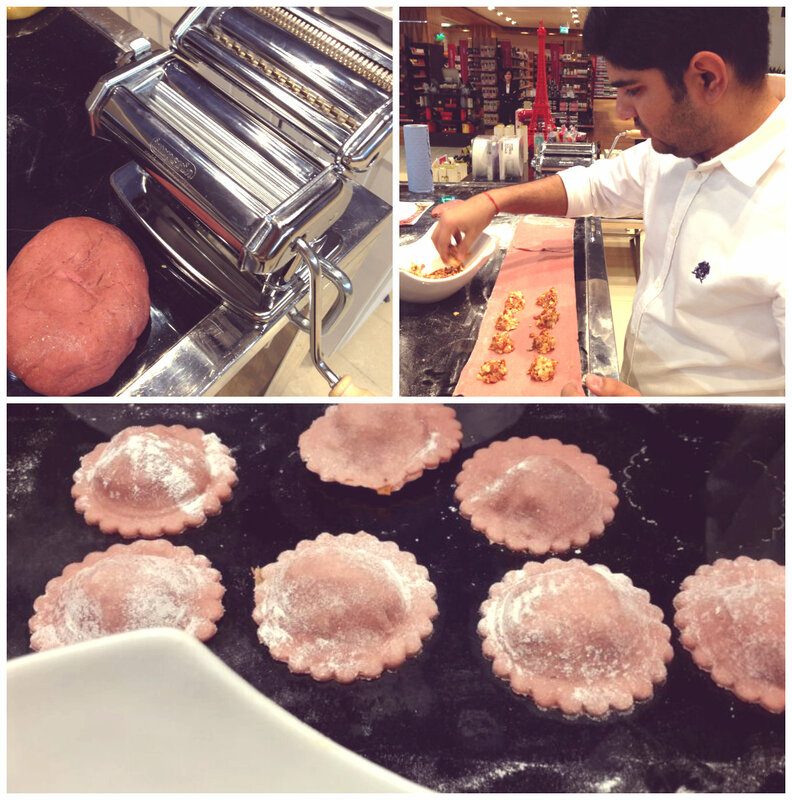 You can see Sahil in the pictures below concentrating on getting the proportion of the filling to pasta right. It took me quite a while to get a hang of making the Tortellini and I have to say I just couldn’t get it right. So here’s the ugly looking Tortellini I made. Chef Russell was kind enough to pep me up and say that at least I managed to get the dough correct. How could we not have dessert! 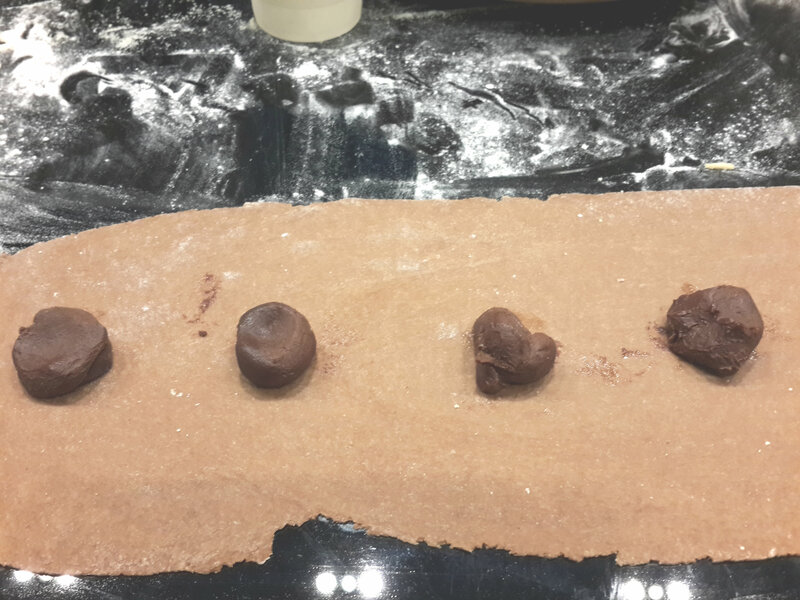 So there comes Chocolate Ravioli *happy dance* We stuffed the ravioli with tiny chocolate ganache logs. We then proceeded to see how the sauces are prepared. 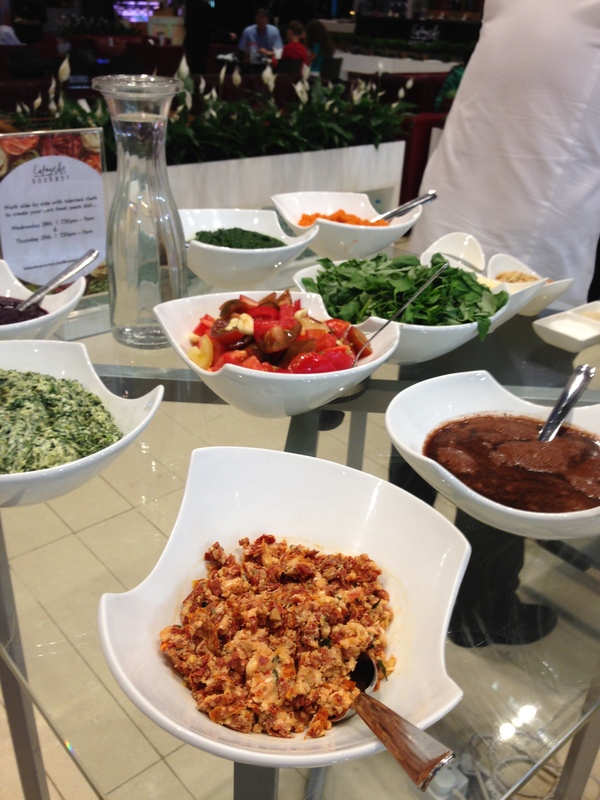 Chef demonstrated the basic pesto sauce and tomato sauce. He had marinated different types of tomatoes with garlic and some oil and let it rest for the flavors to seep in. The pesto was one of the nicest pesto I have ever tasted. The trick was to have more of water and less of oil said the Chef. Nonetheless the texture was creamy because of the parmesan cheese and the sauce was very fragrant and fresh. 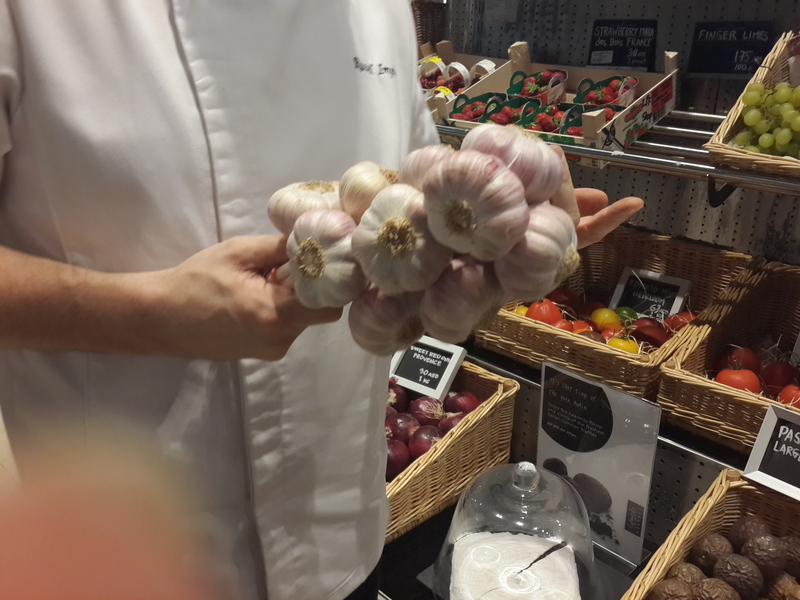 While the team sent the sauces to be used in the kitchen and the pasta to be dished out, Chef took us on an impromptu tour of the ingredients they retail in-store. We tasted different tomatoes, the Baby San Marzano, the Saveol Coeur De Pigeon. The latter was the juiciest tomato I have ever tasted. I also loved the Heirloom tomatoes on display looking very rustic. 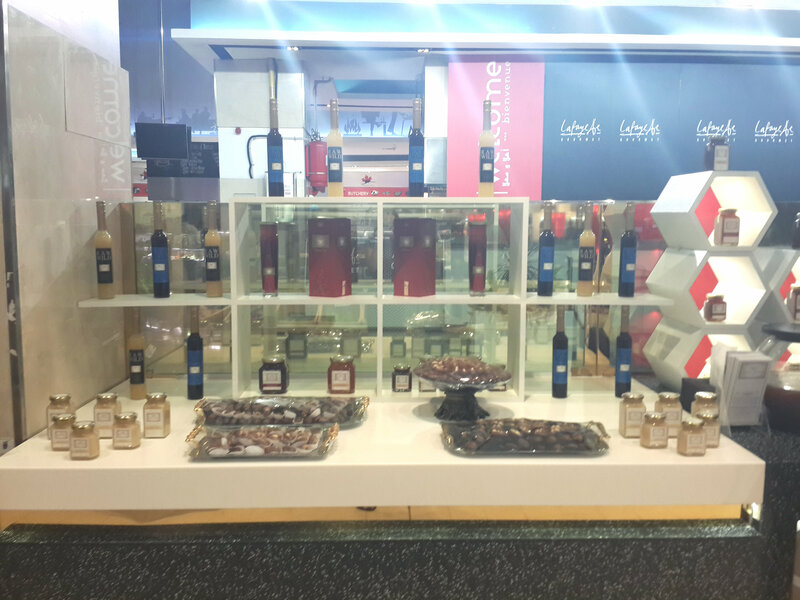 He then introduced us to the different varieties of Balqees Honey on display. We tasted saffron infused, ginger honey and a whole lot of Yemeni honey. 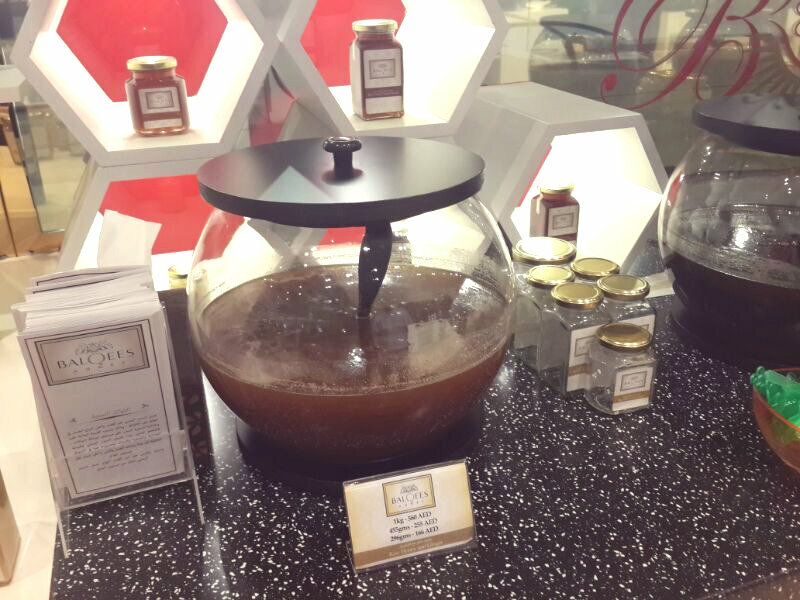 I especially loved the Yemeni honey, it had a wonderful after taste and felt very soothing. He also told us about different ways to use honey in bakes and salad dressings. He was all praises for the health benefits for honey as well. After a couple of minutes was the most fascinating part of this cooking class, the tasting. We got to taste the pasta we had made once the Chef’s team had worked up their magic on them. 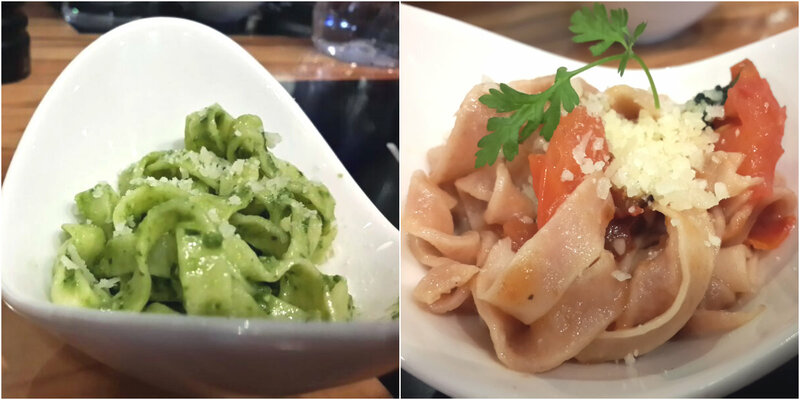 So we started with Tagliatelle Pasta in Pesto sauce and Carrot Tagliatelle in Tomato sauce. 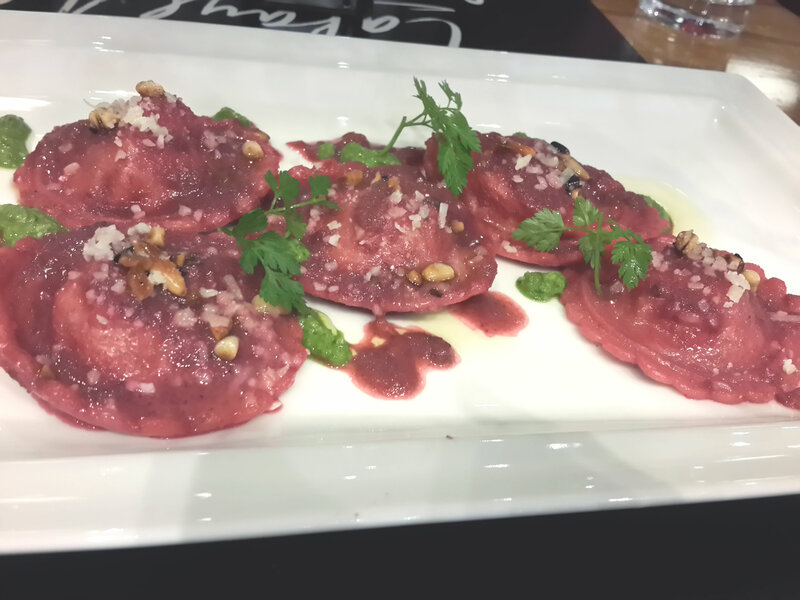 The Beetroot Ravioli came with toasted pine nuts and beetroot reduction and a garnish of fresh parsley. It was the prettiest of the lot. It was followed by the ooh-so-wonderful Spinach Ravioli just doused in butter and sage. This was so delicious I wanted more and kept craving for the rich buttery flavor even on days that followed. After catching up with the fellow participants and ooh-ing and aah-ing over the delicacies, we moved on for desserts. 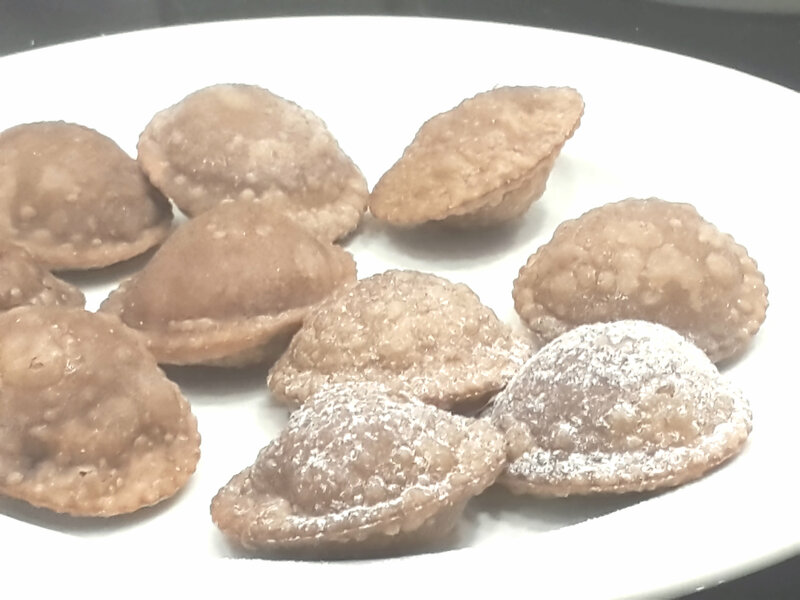 This was fun, chocolate ravioli deep fried just for close to 30 seconds, the result nicely puffed up beauties. 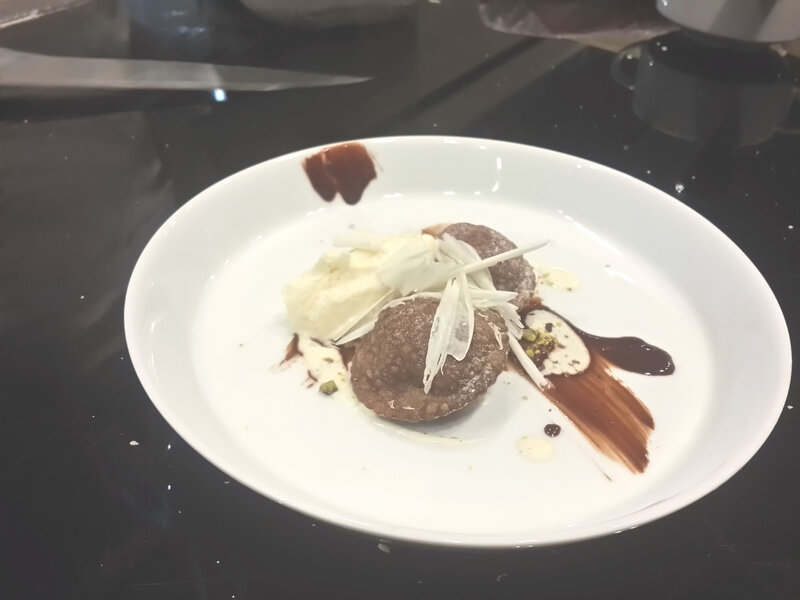 Chef showed us how to plate up a dessert. 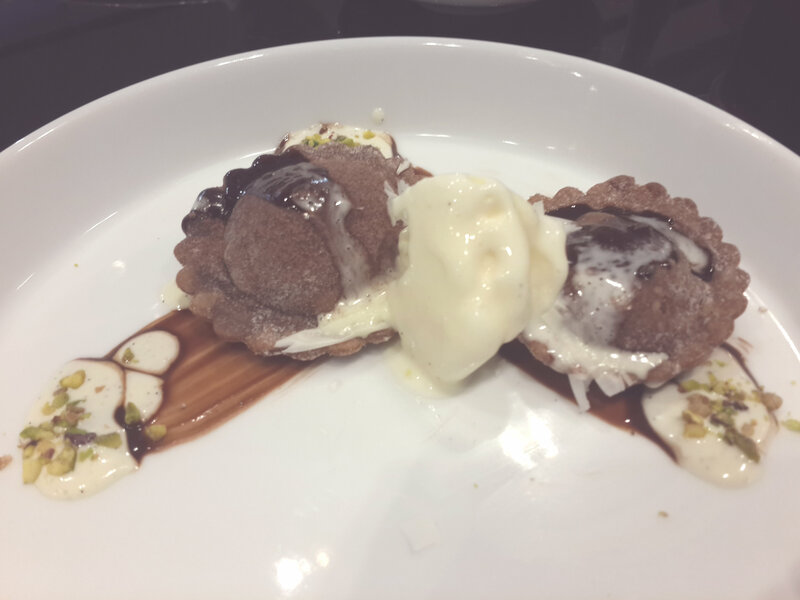 It was served with a smear of chocolate ganache, white chocolate sauce infused with vanilla bean topped with nuts, shredded white chocolate and ice cream. Chef also showed us a few easy techniques on how to get the shredded chocolate and quenelle the ice cream. We plated up our individual portions. 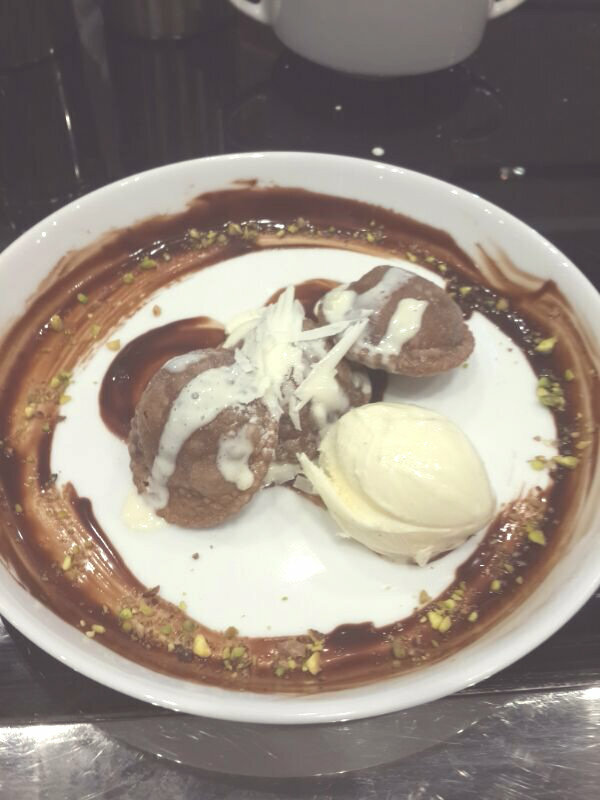 Mine was overdone, I went crazy with heaping the plate with a good dollop of ice cream and chocolate ganache. That’s what I call Awesomeness on a plate, Sahil plated this and Chef declared his plate the prettiest. Win! I came back really happy after the interactive session and a hearty meal. We also got a copy of the recipes. I’m sharing it here so that it gets easy for all of us to try these at home. 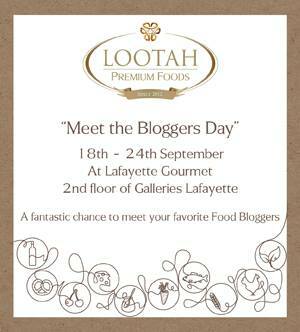 I look forward today for the launch event of Lootah Premium Foods ‘ Meet The Blogger’ Event at Galeries Lafayette Dubai Mall wherein some of the best food bloggers from UAE will be giving a cooking demonstration and showcasing their recipes. The crowd will then be able to taste their delicacies. so now i’m following you. Look forward to looking over your web page for a seccond time.